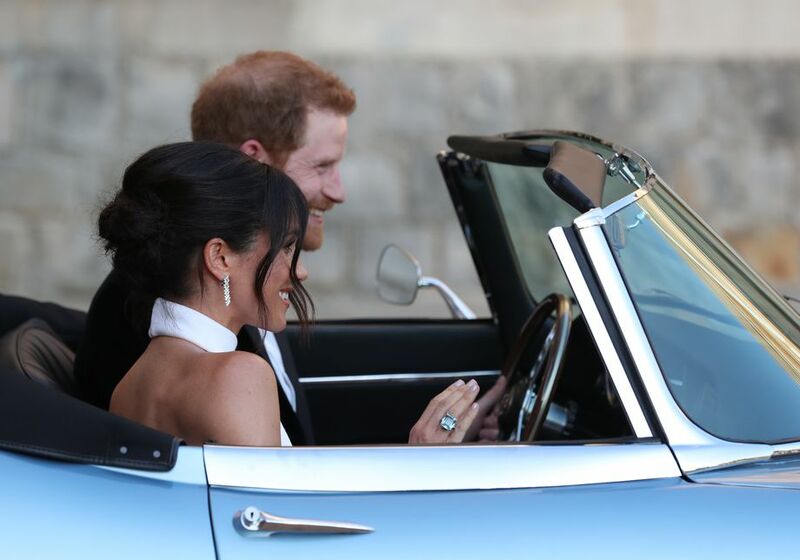 The newlyweds, the Duke and Duchess of Sussex, emerged from Windsor Castle this evening. Prince Harry and Meghan Markle tied the knot at St. George’s Chapel in Windsor Castle this morning, in front of a congregation of 600. The Most Reverend Michael Bruce Curry, the presiding bishop of the Episcopal Church, led the ceremony, invoking the words of Martin Luther King Jr.
Clare Waight Keller, a British woman, and the first female artistic director at Givenchy designed Ms. Markle’s first wedding dress and accompanying five-metre-long train. Ms. Waight Keller is one of the few female artistic directors working at a major luxury conglomerate. She was thankful for being included by the Duchess, Prince Harry and Kensington Palace in the process. The French brand was selected by the newly-minted American royal. It suggested a challenge of outdated mores. In a country of made up of Eurosceptics who voted to leave the European Union, Ms. Markle’s selection spoke volumes—it welcomed global voices into a strict conversation, usually reserved for the British institution and their chosen British brands. An age-old tradition remained. It had to. 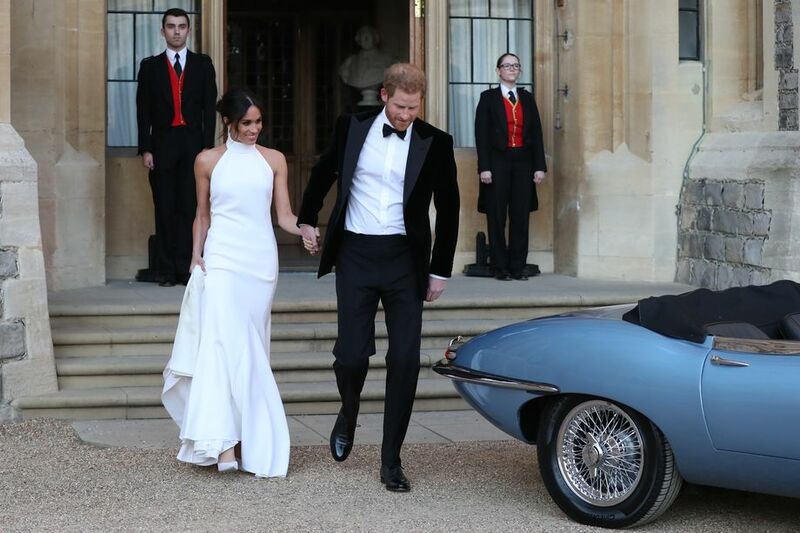 Something old: the 1968 Jaguar E-Type Concept Zero electric car the Prince drove to the evening reception at the nearby Frogmore House. Something new: the high-neck silk crepe Stella McCartney gown in lily-white. Something borrowed: the eye-watering aquamarine ring which belonged to the Duke’s late mother, Diana, Princess of Wales. Something blue: the painted baby-blue soles of her Aquazzura heels. Stella McCartney, who recently bought back the 50 percent of her business owned by luxury holding group Kering, was emphatic, declaring to the New York Times, it was “one of the most humbling moments of my career.” This dress choice was less surprising than her earlier offering; bookmakers predicted Stella McCartney as one of the designers they anticipated Ms. Markle to don and Page Six reported that it was going to be a McCartney gown that would ascend the steps in Windsor earlier today. Something else was at play here. 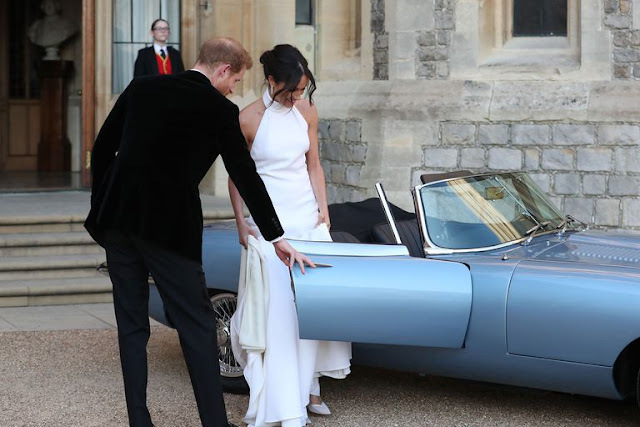 The Prince and Ms. Markle were gently resisting, peacefully protesting the establishment. The car, manufactured in 1968, had been converted to electric power. The shoes were designed by a Colombian man. The door was left ajar, a change could be afoot. ‘What will the future hold?’ was the question we were left asking as the newlyweds shot off into the sunset. Arguably an archaic system, the royal proceedings will silence Ms. Markle. Previous statements about her feminist beliefs or anything noteworthily regarding social politics are less likely to reemerge. Her future will be devoted to charitable causes, ribbon-cuttings and evening receptions. But as the Duchess has proven, simply by wearing gowns designed by prominent women designers, she will work with what she can.